What is the best type of inground pool? If you ask a swimming pool engineer, the unanimous answer will be that an inground gunite pool or in-ground shotcrete pool (synonymous terms) are the best types of inground pools. Gunite is durable and highly customizable. Gunite is also the type of inground pool you will find almost exclusively at commercial locations like hotels, campgrounds and country clubs. Gunite pools are engineered to withstand harsh New England winters and other vicissitudes of nature. There is a misconception (not everything on the internet is true!) 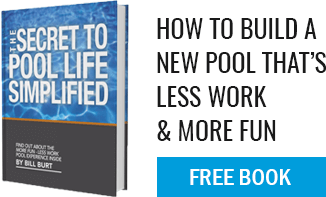 that gunite pools are a better choice for homeowners in the South. That is simply not true. No matter where it is located, a properly engineered inground gunite pool will stand up over time better than any other type of inground pool. A liner pool is nothing more than an above-ground pool put in the ground with some additional supports to hold up the walls; a fiberglass pool is no different than a fiberglass bathtub, just larger. If the winter frost can damage a gunite pool (as the “competition” states), that same frost will surely damage a fiberglass or vinyl wall. A gunite pool is engineered to have tensile strength, not compressive strength, which means it will flex as required, and due to the thickness of the gunite we install, along with the rebar we use, you will end up with the best quality pool possible.